This was designed and built for the Severn Theatre. 3 x Soca wired in parallel to 18 x 16A/1 wired back to terminals. 3 x 16A wired to terminals. 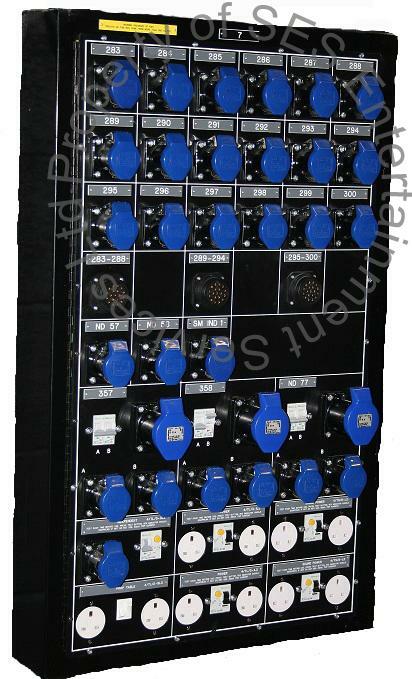 3 x 32A/1 wired in parallel to 2 x 16A/1 protected by 2 x 16A 1P MCB wired back to terminals. 1 x 16A/1 protected by 16A 2P 30mA RCBO wired back to terminal. 5 x twin 32A sockets protected by 5 x 16A RCBO wired back to terminals.